A web application server based on the open-source Apache Tomcat, VMware vFabric tc Server is the choice of the industry today for building and running modern virtual and cloud applications.It is the runtime server which is part of the vFabric cloud application platform. Also with the built-in Spring applications, vFabric tc Server has been successful in satisfying the needs of numerous IT and application operation teams. ManageEngine Applications Manager helps in monitoring the performance and availability of the vFabric tc Server and Spring applications, thus ensuring your business-critical cloud services perform as expected. 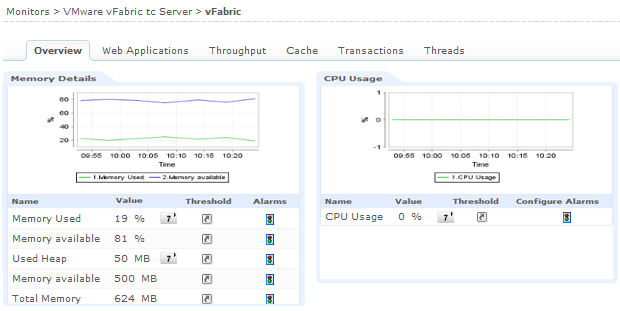 Applications Manager monitors the critical components of the vFabric tc Server to detect any performance problems. It delivers proactive alarm notifications, triggering appropriate actions and empowering the operators with drill-down analysis and reporting. 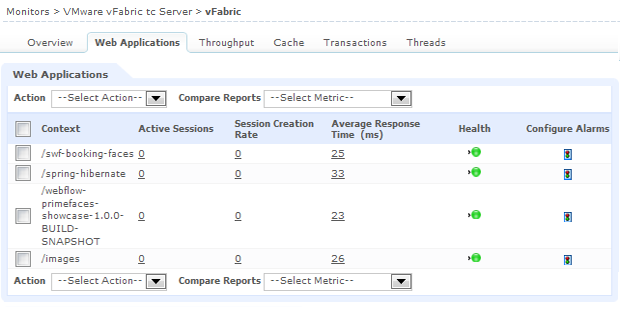 It also provides visibility into the performance of the Spring-powered cloud applications deployed in the vFabric tc Server. When combined with Applications Manager's out-of-the-box monitoring support for VMware servers and cloud instances, the tc Server monitoring capability becomes even more useful. 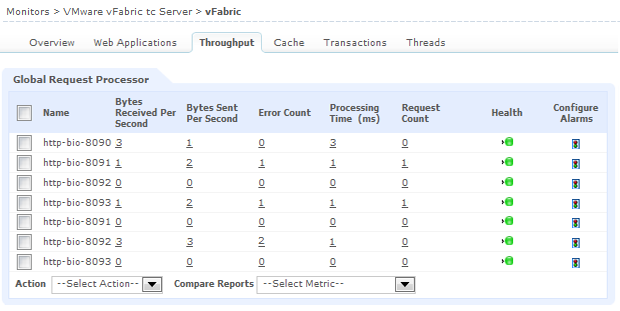 Gain insight into the memory usage and get notified before the server runs out of memory. Identify the various applications running in the vFabric tc Server and their health status.You can also enable or disable the web application from within Applications Manager client itself. Get details on the requests received and sent per second in the server along with the counts for the request not processed, time taken to process the request, etc. 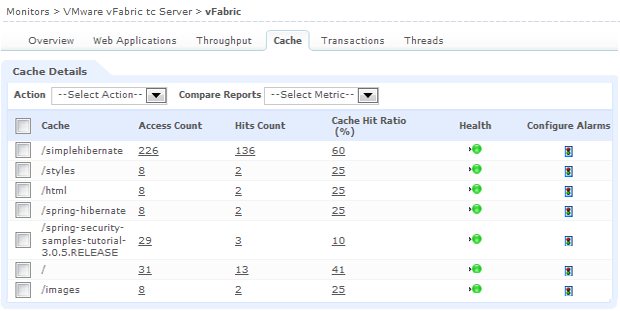 Monitor the cache hits of the applications and get notified when the hit counts or the cache hit ratio violates the threshold. Monitor the transactions in the application level and get notified when the commits, rollback and suspend rates breach the threshold level. 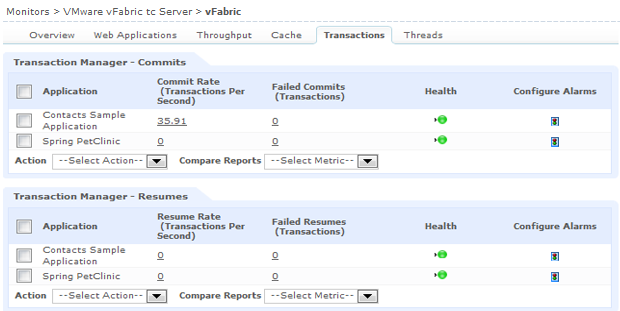 Know how the JVM is performing. Find out the total no. of thread count, no. 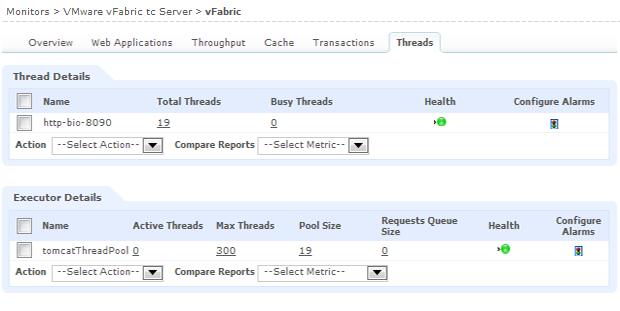 of threads in the running state, threads that are waiting for a task and blocked threads in the JVM.